As the shot clock wound down, point guard Ricardo Ripley sent his defender stumbling with a double crossover at the top of the key. He navigated into the paint and leaped over the helping defender trying to set a charge for the “and 1” layup off the glass. It was that kind of night for Ripley, who finished with a season high 18 points in the 69-55 rout of North Attleboro. “My three-point shooting hasn’t been up to par compared to where I want it to be so I just attacked the basket,” the junior said. Last year, Ripley primarily produced his points from behind the arc, but since his shot is not falling, he has focused on slashing into the paint and creating from there. Ripley, Matt Lowerre (11 points), Mitchell Sirota (13), and Peter Banks (10) led the scoring effort for Sharon. Sirota and Banks stayed out of foul trouble and owned the defensive paint. Coach Ferguson says that they make for a disruptive defensive duo in the frontcourt. “They did a real good job denying the post and our guards did a good job forcing tough passes,” Ferguson said. “They played good straight up defense and once they get going defensively, especially Mitchell with the blocked shots, they’re a pretty good force down low,” he added. Sirota, who recorded 6 blocks in the game, said that his breakout performance is a product of practicing hard and playing as a team. “It’s about consistency. We’re trying to play as well as we do in practice. We put in the time and this breakout is just all our teammates finding the right looks,” senior Mitchell Sirota said. “Mitchell plays with that pure emotion, baby,” Rotman said. Led by Sirota and Peter Banks, Sharon is allowing just 55 points per game. North Attleboro scored 76 points against Taunton, a powerhouse team, but was limited to just 55. Captain Andrew Filipkowski says that Sirota and Banks anchor the best defense in the Hockomock division. “Right now we’re the best defensive team in the Hock,” Filipkowski said. “We’re locking up on D and our offense comes from defense,” the captain added. Senior Tyler Smith agreed with Filipkowski and even took it a step further, saying that the Eagles have the potential to be the best team in the Hockomock. “That was a big win. 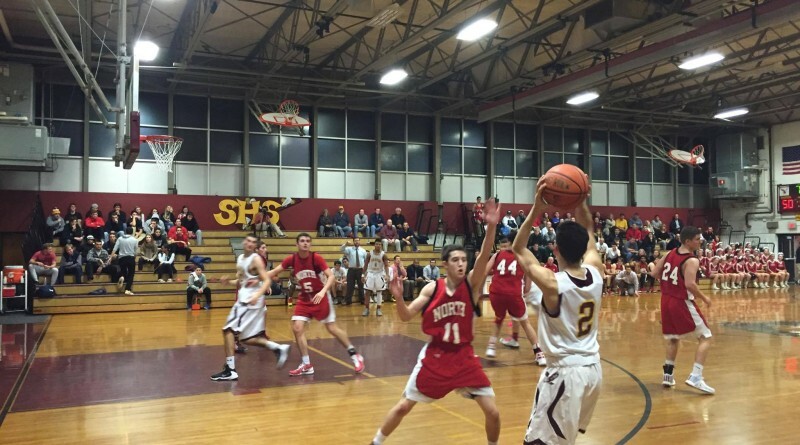 It proved that we are one of the best teams in the Hock right now,” Smith said.